This is a guest post by Kelsey Mikolajczyk. 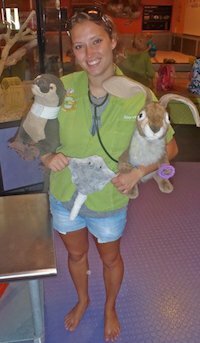 Kelsey recently finished her undergrad degree and is now working at a small animal clinic while preparing vet school applications for this fall. She enjoys line dancing, kickboxing, and hiking with her two dogs. Connect with her on Twitter here! Rabies, salmonella, fat content, and instant recess. All these things may seem unrelated, but they really have a lot in common! You’ll learn about all of them and more when you participate in the Summer Undergraduate Residency in Public Health (SURPH) at Kansas State University. Last summer I had the pleasure of participating in SURPH. I hope to be involved in public health as a veterinarian, and since SURPH was housed at the veterinary school and directed by a public health veterinarian, it seemed like the perfect opportunity to get to know first-hand about vets in public health. I was initially a little leery about the program because there are four emphasis areas covered: infectious and zoonotic disease, food safety, public health nutrition, and public health physical activity. Infectious and zoonotic diseases and food safety were right up my alley. I had little to no interest in the other two. But I couldn’t pass up this opportunity. I applied and was accepted on scholarship in early spring semester. Before I knew it I was headed off to Kansas! SURPH was a phenomenal experience. 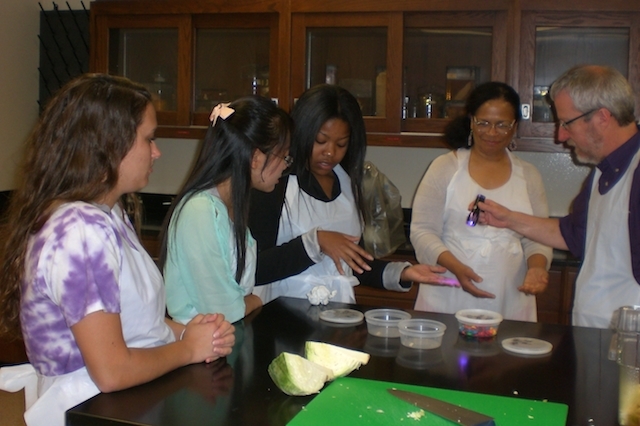 The program is a lecture based class, part of the Pathways to Public Health at K-State. Guest lecturers would come in and speak to us about the emphasis area they are involved in. We had veterinarians, nutritionists, fitness instructors, and researchers in many fields. Each one had fascinating stories and a true passion for their profession. Each lecturer wanted us to enjoy what we were learning and made each experience fun. I ended up enjoying all emphasis areas, and I was able to relate all of them back to veterinary medicine. Another part of the program was the field trips. My personal favorite was visiting the Rabies Laboratory. We started with a great discussion about the virus, and then we were able to see how the lab functioned. Another favorite was visiting the public health extension office in Topeka. We learned about teaching nutrition in school systems and were able to make some very tasty treats! There were optional portions of the program as well. We were able to see the bison research herd, the salt mines, and the cosmosphere. There were also cookouts and helpful professional school lectures. Although we had lots of fun, we did have work to do. SURPH is an eight week, two credit course. There was a writing component where we were asked to evaluate each activity and its relationship to public health. There were also other types of projects, but they were all very fun to complete. The program size is small; we only had eight participants. Thankfully the program was funded by One Health Kansas. The funding covered the in-state tuition cost, dorm-style housing on campus, and a meal plan on campus. With that you are also able to take advantage of the other campus resources including the recreation center and library printing. The only cost I had to pay for was my travel and the difference in out-of-state tuition. I did some exploring while I was in Kansas, so my expenses were higher than most of the other participants. The state of Kansas is absolutely beautiful and I am so happy that I was able to participate in this impressive program. If you are thinking of going into public health as a veterinarian, or looking for other professions in the public health field, I highly recommend applying for SURPH. The instructor and lecturers are phenomenal and always willing to have a discussion about these fascinating topics. Find more information on the program and application here. Elliott here again: Thanks to Kelsey for sharing about this summer program! It sounds like something I would have been really interested in doing myself. I’m sure it would be helpful both in shaping your own career goals and in demonstrating to veterinary schools that you are a well-rounded applicant with unique interests. I heard from the program director, Dr. Kimathi Choma, that there are still spaces available for this summer. He also let me know that international students are definitely eligible to apply and can also receive the program funding on a case-by-case basis. Does this look like something you might be interested in applying for, this summer or sometime in the future? Do you think a program like this would have been helpful in exposing you to these uncommon veterinary fields at an earlier stage in your education? Great post Elliott. Why aren’t these positions snapped up? What a nice program. Keep up the great posts for those vets looking for their way. Thanks for the comment, Radford. I hope you’ll let me know if you come across anything interesting to share!